MaizeLink provides one place for you to find and access the many university tools and systems you use every day. Each “link” in MaizeLink will take you to a particular tool, system, or task, and you can “favorite” the links you use most. If the information below does not address your question, please contact us. To get the most out of MaizeLink, log in (using your umich uniqname and password) and start to customize your home page. The first time you log in, you may be asked if you’d like to connect to Canvas. If you connect to Canvas, you will see your active Canvas courses displayed on your home page. This is optional, and you can always connect or disconnect Canvas later. MaizeLink will automatically detect your role (student, faculty, staff) and display links that are relevant for you. You can customize your home page by adding favorites and bookmarks. Browse Collections: Collections are groups of links related to a particular. You can find these on your home page under the “For Everyone” and “Just for Students/Faculty & Staff” headings. You can also search for collections! Browse Categories: Use the “Browse Categories” menu beneath the search bar to browse by category. Since some links are hidden based on your role, changing your filter to include all roles will expand your search. If you believe the link does not exist, you can request a new link. You will typically be prompted to connect Canvas to MaizeLink on the first time you log in. To connect MaizeLink to Canvas, go to your User Menu > Preferences > Authorize (under “Authorize Canvas Connector”). 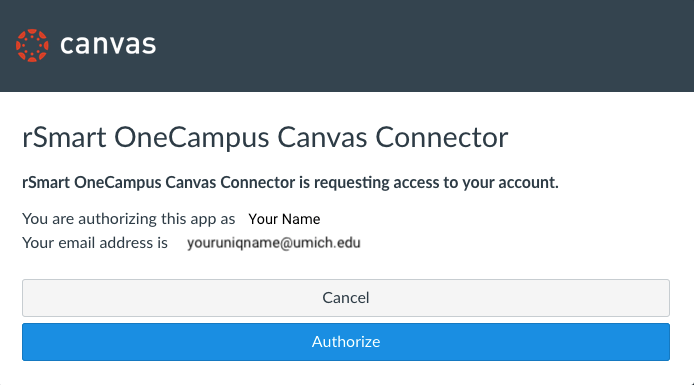 Follow the on-screen prompts to authorize the connection between rSmart OneCampus (MaizeLink) and Canvas. You will see your Canvas courses appear beneath your favorites. You can change your Canvas courses to the “collapsed tile” view by clicking the gear icon next to Canvas Courses. To disconnect Canvas from MaizeLink, go to your User Menu > Preferences > Deauthorize (under “Deauthorize Canvas Connector”). To add a link to your favorites, click the star icon in the bottom right corner of any tile. You can also remove a link from your favorites by clicking the star icon. You can re-order your favorites or add personal bookmarks (e.g., to non-university links). To do this, click the gear icon next to "My Favorite Links." Make sure to click Save to save your changes. By default, MaizeLink will display links based on your role in MCommunity. For example, if you are a student employee, you will see both “Student” and “Faculty & Staff” links. If you’d like to view links for a different role, you can select a different role from the Roles drop-down. You may receive a warning message that you have selected roles that do not match your user roles. That is okay. MaizeLink will remember your most recent selection. You can access all of your Wolverine Access links from MaizeLink. To view all Wolverine Access links, use the “Classic Wolverine Access Links” menu at the top of MaizeLink. MaizeLink also provides direct links that go to specific tasks within Wolverine Access, like Final Grades, Time Reporting, etc. We recommend favoriting the Wolverine Access quick links to save you time!